New terminal development and airfield improvements. The new airport terminal design was inspired by the traditional Inuit kayak. 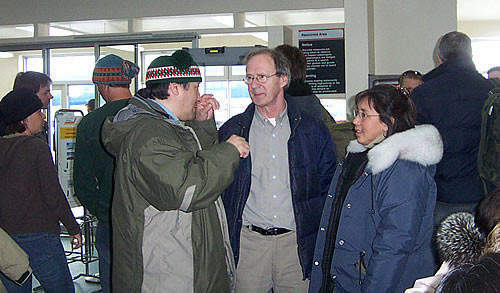 A group waiting to fly at the existing crowded Kuujjuaq Airport terminal. A First Air jet landing at Kuujjuag airport. The existing 1972 terminal in the winter. 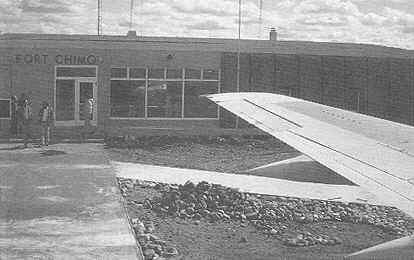 The airport when it first opened as Chimo airbase in 1942. Kuujjuaq Airport (formerly Fort Chimo airport, the name was changed in 1980) is a ‘remote airport’ (designated as remote by the Canadian National Airports Policy) in the north of Quebec in Canada near Ungava Bay. However, it has an important function for the outlying communities situated there as it is their main connection to the outside world, an important transport link all year round. The airport is owned by Transport Canada and has been operated by the Kativik Regional Government since September 1996. The airport has a total land area of 145ha and the facility has an air terminal building of 380m² first built in 1972, a flight service station operated by Nav Canada, an aircraft servicing hangar, a refuelling service and a cargo transportation service. The airport was originally built by the US (with Canada’s permission) in 1942 as part of the USAF Crimson route, which was a short air ferry route to northern Europe from California. The airport came under Canadian control again in 1955 and has been ever since. "Kuujjuaq Airport was originally built by the US in 1942 as part of the USAF Crimson route." 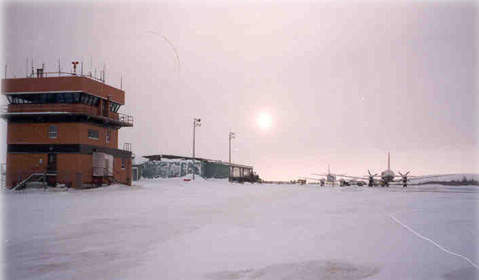 Kuujjuaq airport is situated 1.5km from the village of Kuujjuaq, the administrative centre of Nunavik. The airport serves all the communities along Ungava Bay including Kangiqsualujjuaq, Tasiujaq, Aupaluk, Kangirsuk, Quaqtaq and the Hudson Strait Kangiqsujuaq, Salluit with passenger and cargo services to and from Montreal. In addition to serving the needs of the native Inuit people of the area the airport is also used by over 4,000 hunters and fishermen each year on their journey to the remoter areas of northern Quebec. Although the airport will never be a major transport link in the eyes of the rest of the world it provides essential services to the area. An expansion of Kuajjuaq Airport has been necessitated due to overcorwding during the peak season. "Kuujjuaq Airport serves all the communities along Ungava Bay." In early 2006, after much lobbying, plans were finalised for airport improvements. The work included the expansion of the airport apron and the construction of a brand new terminal building. The new building was designed by Fournier, Gersovitz, Moss and Associates – the same architectural firm which designed Kuujjuaq’s eye-catching Katittavik Centre (cultural centre).The new, more modern facilities allow better levels of safety and security at the airport. The new terminal is over three times the size of the previous terminal building with a small restaurant, extra seating and check-in counter space for more airline booths. The expansion also added 45 new parking spaces and extended the access road to the airport by 100m. The apron was extended by approximately 16,000m² (from 15,230m² to 32,537m²). In June 2006, two expansion contracts worth C14.9m contracts were awarded to Laval Fortin-Adams. "In 2003 the federal government announced a C$2.5m facelift for the Kuujjuaq airport main runway." The first construction contract was worth C$2,477,000 and included the expansion of the apron area, the expansion of the public car park by at least 45 spaces at the airport and improvement of the access road. The other contract was worth C$8,877,000 and was for the construction and outfitting of a new 1,225m² air terminal, which was silver certified under the Canadian LEED (Leadership in Energy and Environmental Design) directives. The work on these two projects commenced in July 2006 and was completed in 2008. The airport underwent a complete review of safety and security procedures and updated essential equipment such as fire fighting units and de-icing equipment. Located in exactly the same spot, the new building lies flat on the ground and is long and narrow in shape, resembling a kayak. The architect Alain Fournier has used this shape to reflect Inuit culture. The kayak came as an inspiration because air terminals are generally long, narrow buildings. An expanded skylight rises up from the terminal’s roof like the cockpit of the kayak. The terminal houses airline counters, baggage rooms, a large security section and a space for a retail operation, such as a combined gift and snack shop. The terminal’s exterior is wrapped in metal cladding, with airtight walls and double vestibules at the entrances to hold heat during the winter. "The new terminal is an LEED silver certified green building." The new terminal is designed to reduce power and resource consumption by being energy-efficient. To cut back on the use of electricity, all rooms were designed to make use of natural light, even those in the middle of the building. Plans also included a solar wall to store energy from the sun for power and to preheat air for the ventilation system. In addition, a reflective roof to deflect heat and opening windows to provide ventilation during the warmer months were included. To conserve water, the terminal has waterless urinals. Construction as per the LEED directive integrated recycled materials and space was set aside to collect and store recyclables in the finished terminal. A series of pipes called thermosyphons keeps the ground frozen under the building and evacuates heat. The pipes provide a passive cooling system to the terminal and, at the same time are integrated into the building’s design as part of the entrance canopy. The new terminal allows for an increase in air traffic to Kuujjuaq. During the construction period, the former terminal was moved near to the Air Inuit staff house. There are two serviceable asphalt runways of 6,000ft by 150ft (14/32 and 08/26) capable of handling medium to large aircraft for passenger and airfreight services. 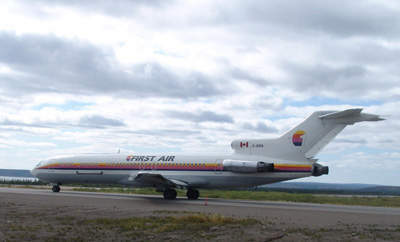 In 2003 the federal government announced a C$2.5m facelift for the Kuujjuaq airport main runway. The funding, which was part of the regular 2003 financial budget of the airport, was for levelling off the runway so that it did not drop abruptly. The work was divided up for completion over two years for minimal disruption to the airport’s daily schedule. The levelling was completed by late 2004. The project contract was awarded to Mont-Sterling Pats Parts. In 2002, Nav Canada officially unveiled a C$7m facility, located near Kuujjuaq. When the radar station started operating it allowed air traffic controllers in Montreal and elsewhere to see the exact positions of high-flying jets on their radar screens. Air traffic controllers can now follow a steady stream of transatlantic air traffic over Kuujjuaq, all the way to Labrador.